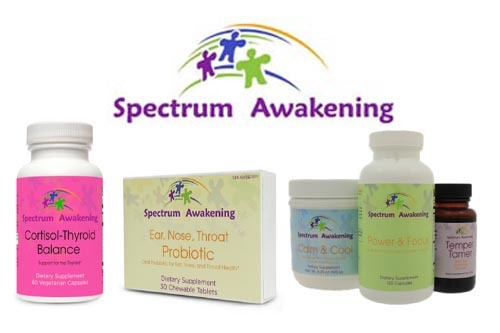 WakeUp proudly ANNOUNCES our latest sponsor SPECTRUM AWAKENING, and the WakeUP CARES packages. In recognition of Autism Awareness Month, WakeUP is giving away 10 custom designed CARE packages consisting of the finest supplements by our new sponsor, Spectrum Awakening. Spectrum Awakening produces a line of all-natural Dairy-Free, Gluten-Free, Soy-Free supplements developed by a team of DAN certified physicians, as led by Dr. Jared M. Skowron. Their treatments help children maintain healthy development. Whether your challenges include behavior, speech, sleep, social anxiety, sensory or other issues and developmental concerns, there is a supplement to help! Dr. Skowron has been working with children with special needs for over a decade. His specialty is supporting healthy neurological development using only natural, non-pharmaceutical therapies. Dr. Skowron is the Amazon best-selling author of the children’s natural health guide, 100 Natural Remedies For Your Child. He created Spectrum Awakening supplements so that all families and children could benefit from the same treatments that he uses in his private practice. “Been using “Power & Focus” and “Calm & Cool”…. oh what a difference it has made. It’s not a cure, but our stuttering and speech disfluency has eased”. ~Dionna K., New Orleans, Mom of 5 year old. 10 lucky families will enter to win a custom, loving gift-box of supplements courtesy of Spectrum Awakening and WakeUP.